I am a Neal Adams fan as I am sure many of you are. I love his Superman covers, he did dozens from the late 60s to the early 70s. My favorite cover is a 100 page Super Spectacular that I wrote about here, but a close second is this Action Comics cover. 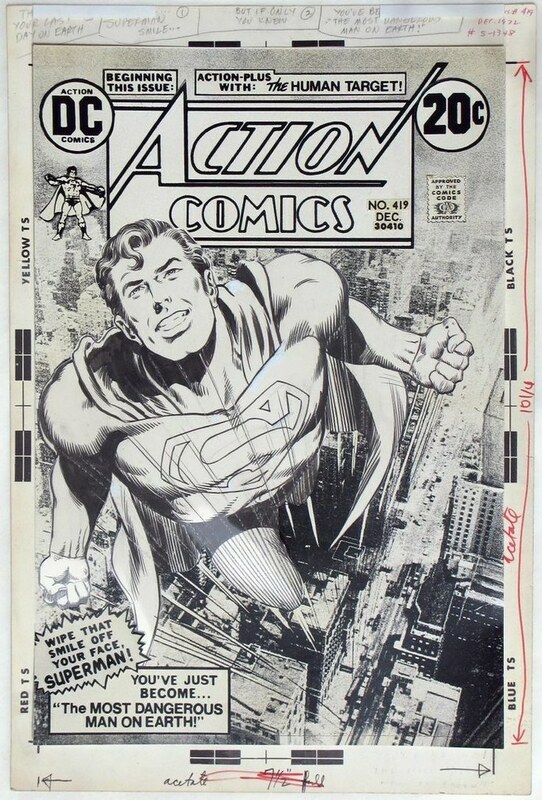 Action Comics 419, drawn by Neal Adams, inked by Murphy Anderson, and some collage work by Jack Adler using a real photo. It's a super (pun intended) cover showcasing the classic Man of Steel. The image of Superman has been lifted off this cover and used in all kinds of merchandising. 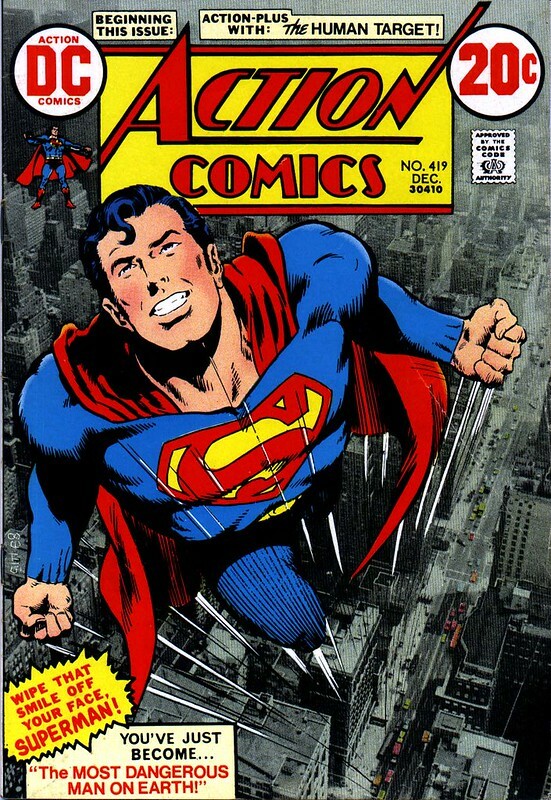 I believe this issue of Action Comics is the first one edited by Julius Schwartz, who took over from Murray Boltinoff. Update October 2017: I met Adams at a con 2 months ago & asked him about this cover. He said Jack Adler did not provide the photo background, it was Adams himself who did the collage. Also he didn’t really like Murphy Anderson’s inks, too slick in his opinion. Here is the original art to the cover with notes to the letterer about the cover blurbs below. One interesting thing about this original art is that it is now owned by David Mandel, a veteran writer in Hollywood who has worked on Seinfeld, Curb Your Enthusiasm, Veep and many other shows. He owns many other classic original art covers from the Bronze Age as well as this one. In addition to a new editor, the letter column header also changed, showing Clark Kent changing into Superman through a phone booth (remember those?) at super speed! How many times have you seen the image of Superman from Action Comics 419 used in merchandise? Cups? Books? I would love to know. Please leave a comment if you had ever seen this elsewhere. 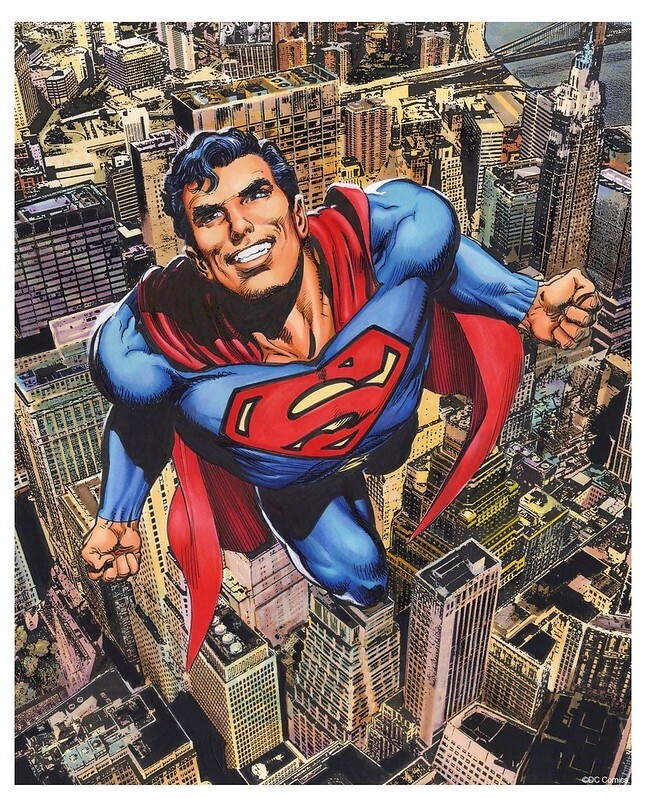 Update October 2017: At the convention where I met Neal Adams, he had a huge booth with posters for sale, including this new take on the Action Comics cover, pencilled and inked by Adams. The city scape below is also redone.